CHICAGO (AP) — The Obama administration is delaying yet another aspect of the health care law, putting off until next November the launch of an online portal to the health insurance marketplace for small businesses. The move, announced Wednesday, was needed because repairs are still underway to the troubled HealthCare.gov website, which is the primary way for individuals to apply for insurance, and that has priority, federal officials said. In a conference call with reporters, administration officials said employers who want to buy marketplace plans for their workers now will need to go through an agent, broker or insurance company this year, instead of using the government website. The administration said the plan will still allow small businesses to buy coverage but avoid slowing technical repairs to the hobbled federal online site. Under the law, most small businesses do not have to provide coverage. But firms with 50 or more employees face a mandate to offer insurance or risk fines from the government in 2015. The HealthCare.gov site, where individuals without employer-sponsored health care can shop for insurance, is now smoothly handling 25,000 users at the same time and is on track to meet its goal of handling 50,000 simultaneous users by Saturday, said administration spokeswoman Julie Bataille. "We have a lot of work left to do in the next few days," she said. 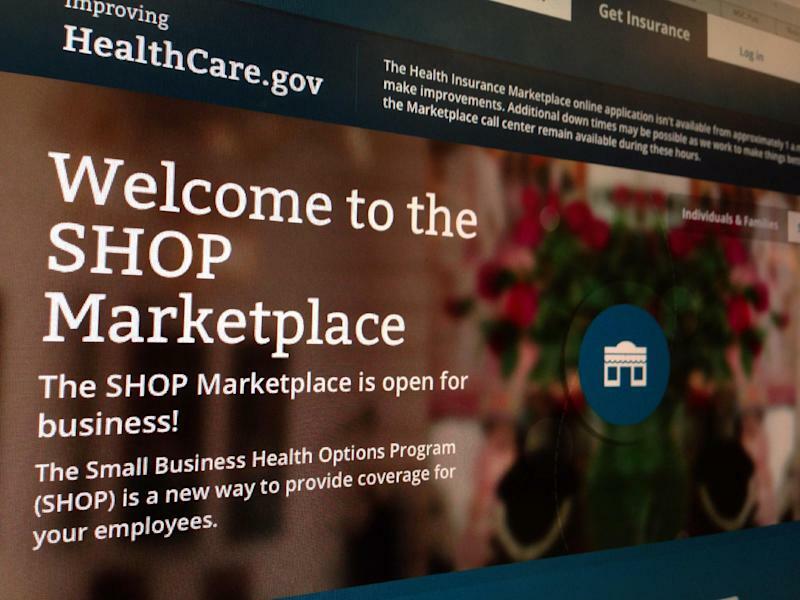 The small business marketplace, also called SHOP, was supposed to provide employers a new way to shop for coverage. The website was to make comparison shopping easier while promoting competition and keeping premiums down. The delay, which doesn't affect states running their own marketplaces, was met with frustration. "It's disappointing that the online portion of the federal small business marketplace through Healthcare.gov will be delayed, and it's important it get up and running as soon as possible," said John Arensmeyer, CEO of Small Business Majority, an advocacy group that supports the health care law. "However, it doesn't change the fact that the marketplace can offer the most competitive combination of price and quality for small businesses purchasing health insurance." The National Retail Federation, which has been working to ease the law's requirements for its members, was less generous. "If the law is so burdensome for the administration to implement, just think how hard it is for small businesses, which are focused on growing a company, hiring new employees and assisting customers," said Neil Trautwein, the group's top health policy official, in a statement. Ohio's insurance director, Mary Taylor, a Republican who is also lieutenant governor, said in a written statement that the delay adds to the struggles of small businesses and "only further complicates an already chaotic insurance market." Small businesses buying coverage will still be eligible for tax credits to bring down the cost, according to the administration. Starting next year, small businesses can claim a credit of up to 50 percent of their contributions to premiums for insurance purchased through the SHOP, and the administration is telling business owners that buying marketplace plans through brokers, agents and insurers will count for that tax credit. Wednesday's setback was the latest in a stream of missed deadlines, including a postponement for a Spanish-language sign-up tool announced this week. The administration also recently pushed back the enrollment deadline for individuals: People who sign up by Dec. 23 can get coverage that starts on Jan. 1. In an earlier delay, businesses with more than 50 workers were given until 2015 to meet the requirement to provide health insurance without paying a penalty. And the deadline date for individuals to avoid penalties for failing to get coverage was pushed back six weeks. Last week, the administration also announced a schedule change in next year's open enrollment season. It will start on Nov. 15, 2014, a month later than originally scheduled, and finish on Jan. 15, 2015, about five weeks later than originally scheduled. The midterm congressional elections are Nov. 4, and congressional Republicans accused the administration of shifting the dates for political reasons, to hide any spike in 2015 premiums. The administration earlier had announced it will allow insurance companies to extend for another year coverage under individual policies that don't meet new coverage requirements. That move was a response to anger over a wave of more than 4 million policy cancellations. The series of delays was seized upon by Rep. Sam Graves, R-Mo., chairman of the House Small Business Committee. "In the midst of the angst and uncertainty that small businesses and Americans feel about Obamacare, today's news of yet another last-minute delay is just more proof that the law is unworkable and bad for small businesses," Graves said in a statement.